Aaron is married to his best friend, Morgan. They have four children & currently live in Ft. Worth, Texas where they own a salon. Aaron also works as Dir. of Sales & Marketing for Chamberlain’s Leather Milk. 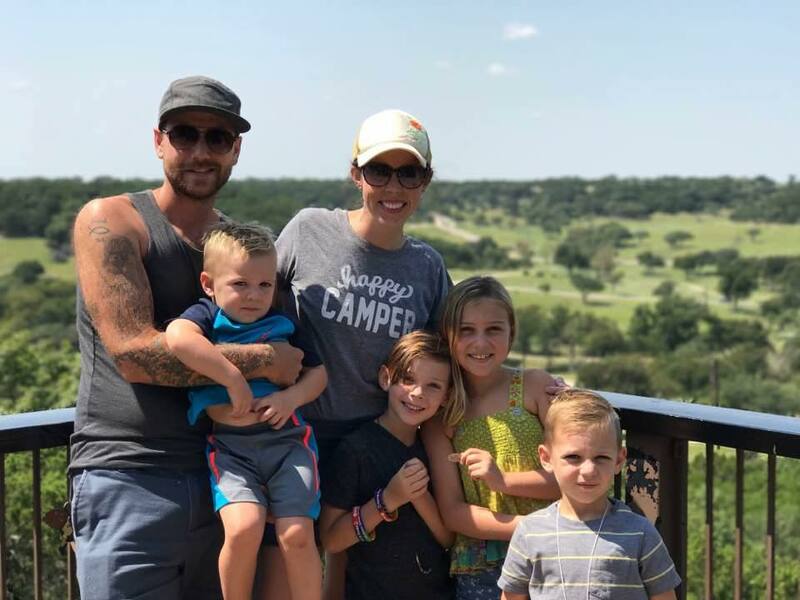 They returned “home” to Ft. Worth in 2013 after two years in Las Vegas followed by three years in Austin where Aaron was the Director of Intentional Gatherings, a non-profit organization they started together in 2007. The last seven years have been spent living & training others to start new communities of faith “outside of the walls”. While not in vocational ministry any longer the Snow’s have a passion to see new organic faith communities started with a focus on discipleship, relationships, and multiplication that takes place in the lives of the ordinary believer. Aaron has a deep passion to see all followers of Jesus live out these principles in the workplace, and is becoming more and more convinced that believers being in “secular” work is a critical key for seeing the Great Commission fulfilled. Deep relationships are of utmost importance to the Snow’s. When they aren’t sharing a meal with friends you can find them camping, hiking, cycling, or playing at the park. Aaron, I met you at Club Christ in Vegas and then a couple other times through RCF. I am Natalie, I did the Martin Luther King was a Peaceful Man thing with you and the kids. I had no idea you were doing this program and that you were the founder/director, etc. I read this and am very impressed and excited. I was once involved in a similar organization here in Boise, but it went sour. I am leaving Vegas and transferring to Boise State as of January but I hope we can keep in touch. I am hoping to get involved in campus Crusades at BSU and to see what else God has planned for me in this change. I feel there were more opportunities in Vegas so I am praying that God will show me his awesomeness here in Boise as well. Thanks for all you and Morgan are doing. Hey Natalie! It was good to meet you at CC, and the other times as well. I hope things go well for you in Boise. What organization were you involved with there? There’s a couple of guys who were in Vegas over the summer who are from Boise. They were interested in what our organization does, so we had a brief meeting about them starting their own “Missional Community” there in Boise at their school. We’re all about helping to empower young people all over the country to start their own student led churches on campus, or in their neighborhoods. Let me know if you’re ever interested in anything like that! Take care. Aaron, I’ve read your stuff on Shapevine and have really been encouraged and challenged. Thanks for your posts. I’ve also taken a peak at your Intentional Gatherings stuff and really liked that as well. I wanted to ask some questions because some friends and I are in the process of trying to plant organic churches in our city. A little background: We live in an old steel town on the Ohio River, just north of Pittsburgh. It’s a depressed community because all the jobs left in the 80s. Five years ago, my friend started a non-profit working with kids starting in the summer and now going throughout the year. A bunch of people who began as summer staff, myself included, felt called to come live in the city and help with the ministry. We have gained trust and made many relationships through the programs, and now we want to take the next step, making disciples and planting churches. We have seen fruit with kids choosing to follow Jesus, but it’s not quite there with adults yet. We are now looking for ways to further the relationships that have been made. Most church planting people are all about 3rd places these days, but we don’t really have adequate third places because our town’s depressed state. So our thinking was to kind of create those third places by having normal social gatherings (meals, cards, games, etc), combining those who are living here together to be the body of Christ and those who we have relationships with that don’t yet know Jesus. We hope that as people see the family of God living together and we grow these relationships that the Lord will draw people to Himself – I’ve taken a lot of inspiration from Tim Chester and Total Church. Of course, there’s more to it, but that’s a quick rundown of our context. I’ve seen your stuff in Ft. Worth and was wondering if you might have some insights on how you guys got things rolling, how you built relationships, and what you know to be important and effective in building missional church in a poor urban community. Thanks for your help. Hey man! It’s good to hear from the East Coast! Man, I loved reading your story, and hearing what you and your friends are doing in your town. Sounds legit. I’d love to chat with you sometime on Skype on the phone or whatever so we can dive into some of this stuff at a bit deeper level. I’d also love to explore some different possibilities we may have to learn/teach/sharpen one another as we’re on mission for the kingdom in this world: you guys takin a trip to Ft. Worth to spend some time at the I.G. House in that inner city neighborhood. Or, coming to Vegas to visit us here. Or, us coming there to see what you guys have goin on, etc. Anyhow, please feel free to email me at aaron@intentionalgatherings.com and we can swap numbers or skype names and work out a time to chat. I look forward to connecting further with you man. Take care. Oh, the Total Church guys are incredible. We went to the “Total Church” conference in San Diego back in August and learned a lot from them. Haven’t read the book yet, but i’m certain it’s great. Take care! My name is Charl and I am from Pretoria, South Africa; I love your site. Hope you don’t mind but I have add you to my Blogroll. I love to read on what you are doing, I myself is on the organic community journey with Jesus, seeking a community where Jesus can be expressed. Hey! Thanks for the comment! I think we might know some mutual friends…do you know John & Gao Foua Jordan? From your story it sounds like you work directly with them at the kids camp there in Aliquippa, right!? I could be wrong, but it sounds the same! =) I was just in Pittsburgh a couple weeks ago! It’s so crazy to get this comment from you because a little over a year ago I got almost the exact same message from John! He and I ended up chatting via skype, and have seen each other a few times in person since then! Him and Gao Foua stayed with us in Austin a few months ago when they were in town! Haha! That being said, I would LOVE to chat with you sometime about your questions. You can probably get some info from the Jordan’s, but either way I’d still love to chat. Shoot me an email at aaron@intentionalgatherings.com and we can set up a time to chat via phone or skype. Look forward to hearing from you!